How it is being used on you and your children today. "Hegel's "scientific" formula establishes the child's carnal nature ("human nature") over and therefore against the father's/Father's authority. If you want to get ride of the father's/Father's authority, which is based upon faith, i.e., doing right and not wrong according to established commands, rules, facts, and truth which have to be accepted as "is," you have to focus upon and 'justify' the child's carnal nature, i.e., the child's "feelings" of the 'moment, i.e., the child's desire for ("lusting" after) the carnal pleasures of the 'moment' (dopamine emancipation), which are stimulated by the world, which is subject to sight. Following this 'logic,' i.e., formula your spouse is not yours, your children are not yours, your property is not yours, your business is not your, your soul is not yours but belongs to the collective, i.e., to the "common-unity" and the social-psychologists who, through dialectic 'reasoning,' i.e., "self" 'justification' "help" 'liberate' you, your spouse, children, etc., out from under from the father's/Father's authority. 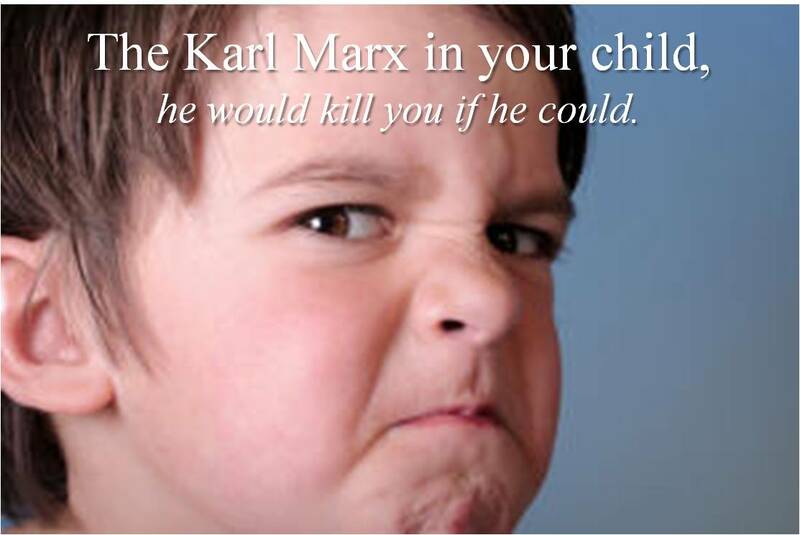 By building society upon the child's carnal nature, 'justifying' it over and therefore against the father's/Father's authority, Hegel, Marx, Freud, etc.,, knew that the guilty conscience which it engenders could be negated, 'liberating' society from any tendency it might have to returning the father's/Father's authority. It is the father's/Father's authority system of doing right and not wrong according to established commands, rules, facts, and truth that engenders a guilty conscience ("private convictions") in children when they do wrong, disobey, sin or are tempted to do wrong, disobey, sin. (Romans 7:14-25) Conversely, it is the children's "feelings," i.e., their desire for the carnal pleasures of the 'moment,' which are stimulated by the world, that engenders the so called "super-ego." As long as the father's/Father's "top-down," "do right-not wrong" authority system (formula or political system) remains in place, children must humble, deny, die to, control, discipline their "self," i.e., capitulate their "self" (from where we get the word capitalism) in order (as in "old" world order) to do the father's/Father's will, having a guilty conscience when they do wrong, disobey, sin, evaluating their "self" in the light of the father's/Father's commands, rules, facts, and truth, i.e., preaching to, teaching, and discussing with their "self," i.e., correcting, reproving, rebuking, chastening their "self" (when they are doing wrong or are tempted to do wrong) in order to do right, i.e., in order to do the father's/Father's will. Righteousness can never be attained by doing good works. Righteousness has to be imputed by God, who alone is righteous, with good works (obedience) following having faith in Him. While dad and mom are not perfect, they might be (or may have been) down right tyrants, the office of authority they occupy is perfect, having been given to them by God, who is perfect, in which to serve Him. While the office of authority itself is perfect, the problem lies in the one occupying it. While some father's are benevolent (loving and caring) others are not. There is a difference between the benevolent and the tyrannical father. This is important to know since those who hate the father's/Father's authority lump them both together (making them one and the same) in order to 'justify' their "self," i.e., in order to 'justify' their hate of the father's/Father's authority itself. It is here that opinions or theory, i.e., dialogue makes the father's/Father's authority system, i.e., preaching, teaching, discussing, rewarding, chastening, casting out the "problem," i.e., the source of conflict, tension, and division, making the children's "feelings," i.e., "self" 'justification,' i.e., "self" esteem the solution, i.e., the pathway to "worldly peace and socialist harmony"—'liberating' "self" from not only having to do right, obey, not sin (according to established commands, rules, facts, and truth) but from having a guilty conscience for doing wrong, disobeying, sinning as well (which causes "repression" and "alienation," making "self" and others "feel bad" for doing wrong, disobeying, sinning, i.e., for being "human"). The benevolent father, loving his children but hating what they do when they do wrong, disobey, sin, judges his children according to their actions, i.e., judges his children's thoughts, which are revealed (made manifest) by their actions, showing mercy to them when they repent, ask for forgives, do right, and obey—knowing that he himself is accountable to God for his thoughts and actions as well, therefore willing to discuss things with his children when time permits, when they are able to understand, and if they are not challenging his authority, with the father willing to accept and admit that he is wrong, when he is wrong. This is "the love of the Father" which the benevolent father has within himself. The tyrannical father, on the other hand, hating restraint, hating being judged himself, places his love of pleasure ("self") over his children, i.e., over providing for, protecting, loving his children—training them up to do right and not wrong, i.e., training them up "in the admonition of the Lord." He refuses to discuss things with his children (even when he can, when they can understand, when they are not questioning, challenging, defying, disregarding, attacking his authority), showing no mercy to them when they "get in his way." The more "self"-ish, i.e., "of and for self" he becomes the more tyrannical he becomes. This is true for the child as well, with the child either becoming mature, knowing right from wrong, doing right instead of wrong according to established commands, rules, facts, and truth which he has been taught (heard) or remaining immature, following after his "feelings" only, instead, making pleasure "right" and restraint, i.e., anything/anyone inhibiting or blocking it "wrong." Living the world of his own making (in his mind), i.e., a world of the "eternal present," with pleasure-pain as his only guide, when he does wrong (which is punishable) he perceives himself as having done nothing wrong, only having done things badly (which is not punishable), yet judges anyone who "gets in his way," i.e., who hurts his "feelings" as having done wrong (which is punishable). The children's carnal nature (formula or political system) is based upon 1) "lusting" after the carnal pleasures of the 'moment' (dopamine emancipation) which the world stimulates and 2) hating restraint, i.e., hating the father's/Father's authority when it "gets in the way," evaluating the father's/Father's commands, rules, facts, and truth from their carnal desires, i.e., according to their "self interests" of the 'moment' (aufheben). This is why children (knowingly or unknowingly) refuse to go into discussion (since discussion places them under the father's/Father's authority—making them subject to doing right and not wrong according to his/His established commands, rules, facts and truth, making them accountable for their actions), asking "Why?" instead, in response to their father's/Father's command or rule that "gets in their way," trying to get the father/Father into dialogue (there is no father's/Father's authority in dialogue—in dialogue there is only the father's and the children's "feelings," i.e., their carnal desires of the 'moment,' with the children desiring to "do their own thing," i.e., have "relationship" with the world, and the father's/Father's desiring to retain "relationship" with, i.e., respect from the children—which engenders cognitive dissonance, where a person is caught between their belief, i.e., facts and truth and their carnal desire of the 'moment,' i.e., their "feelings") with the father/Father, in order to maintain authority, cutting off dialogue with "Because I said so"/"It is written" (since dialogue is the praxis of questioning, challenging, defying, disregarding, attacking the father's/Father's authority, refusing to make doing right and not wrong, according to established standards, the standard for life) resulting in the children then talking to (dialoguing with) their "self" (out of fear of being chastened or cast out), 'justifying' their "self," i.e., 'justifying' their carnal desires of the 'moment,' i.e., 'justifying' their love of pleasure—which automatically 'justifies' their hate of restraint, i.e., their hate of the father's/Father's authority. It is in dialogue, i.e., in "self" 'justification' that, according to Georg Hegel, 'liberation' from the father's/Father's authority, i.e., 'liberation' from discussion (objective truth) resides—'liberating' children to be their "self," as they were before the father's/Father's first command, rule, fact, or truth came into their lives, i.e., carnal, i.e., of and for their "self" and the world ("human nature") only. It is therefore, not only in the children's carnal nature, but in their ability to 'justify' their "self" (over and therefore against the father's/Father's authority) that Hegel's "scientific" formula, i.e., dialectic (dialogue) 'reasoning' resides. Anywhere you apply it—when people willingly participate—it works. Without dissatisfaction, i.e., without resentment and hatred toward restraint, i.e., without resentment and hatred toward the father's/Father's authority, which engenders "self" 'justification,' i.e., dialectic 'reasoning,' i.e., dialogue, 'change,' i.e., 'liberation' from the father's/Father's authority can not be initiated and sustained. It is in dialogue, i.e., in "self" 'justification' that utopia, i.e., the world as it "ought" to be is created in the carnal mind. Like a child turning a broomstick into a horse socialists, 'liberals' require all to ride (support) their dream, i.e., the world as it "'ought' to be" (in their mind). In this way, the world they imagine becomes, to them, "rational," i.e., "reality," requiring all to participate "or else" be 'labeled,' i.e., classified as being "negative," divisive, hateful, intolerant, bigoted, prejudiced, a "lower-order-thinker," maladjusted, not a "team builder," "psychological," mentally ill, "in denial," a sociopath, a Fascist, a Nazi, a racist, neurotic, phobic, unreasonable, irrational, etc., and therefore irrelevant, i.e., removed from their dream. For example, since they embody in their thinking a world of "oneness," where all are equal (on a global scale—negating the concept of sovereignty, i.e., individuality, under God (sovereignty), "Mine. Not yours." as in "My children. Not yours." My property. Not yours." "My business. Not yours." "My country. Not yours." etc.,), anyone opposing (exposing) them automatically becomes labeled a racist, i.e., a fascist needing to be converted, silences, i.e., censored, or removed for the "good" of "the people," i.e., for the "good" of their dream, i.e., for the "good" of their "feelings." It is easier to 'change' the children's paradigm, i.e., the children's way of thinking and acting—'liberating' them from the Patriarchal Paradigm, which resists 'change,' i.e., 'liberating' them to be of and for the Heresiarchal Paradigm, which engenders 'change' only instead—if it is done in a "group" setting. The pleasure which comes with group approval, i.e., affirmation, i.e., the consensus process (being approved by and approving others, i.e., being accepted) is not only intoxication, it is addictive and possessive as well. This is why education—for all ages and in all professions—has been 'changed' from 1) preaching commands and rules to be obeyed as given, teaching facts and truth to be accepted as is, discussing questions (at the one in authority's' discretion, i.e., whether they have time, those under authority are able to understand, and/or they are not questioning, challenging, defying, disregarding, attacking authority), 2) rewarding and/or blessing those who do things right, obey, do not sin, 3) chastening or correcting those who do wrong, disobey, sin, and 4) casting out or rejecting those who question, challenge, defy, disregard, attack authority, which is "negative" to the carnally minded, to dialoguing opinions to a consensus, which is done in a "group" setting, with the 'leader' of "the group," i.e., the psychotherapist, the facilitator of 'change', in the "group grade" classroom, "helping" children 'liberate' their "self" from the father's/Father's authority thereby negating the father's/Father's authority in their thoughts and actions ("theory and practice"), negating the guilty conscience for doing wrong, disobeying, sinning in the process—so they can do wrong, disobey, sin with impunity. The "educator" does not have to tell the students to question, challenge, defy, disregard, attack authority (when they get home), after participating in the dialoguing of opinions to a consensus "group grade" classroom, they will do that automatically, it comes naturally. This same formula applies to (affects) all organizations and institutions, including the "church." What nobody seems to understand these days (other than those doing it) is that 'change' is a "scientific" formula, making everything that it is used on, material, i.e., of nature only, i.e., worldly. While everybody is going after organizations, institutions, people, etc., they are not addressing the formula that is being used in order to initiate and sustain 'change.' Most using the formula do not understand it themselves but use it anyway, since it works, i.e., accomplishes its intended purpose, i.e., 'change,' i.e., 'liberation' from restraint. The difference between capitalism (capitulation) and socialism ("building relationship on self interest") is the perception of money, one making it by putting people to work (taking a risk), the other taking it from the people, in the name of "the people," so they, i.e., socialists can live off of it for their own pleasure, without having to work (risk free). While capitalists may be either benevolent or tyrannical or somewhere in between, having a guilty conscience for doing wrong, socialist live for the pleasure (love) of money alone, having no guilty conscience regarding who they might hurt or destroy along the way (despite what they might say or what it appears at first). With them, the end justifies the means. This is the foundation ("shifting sands") of the so called "new" world order. The formula is: the dialoguing of opinions to a consensus (affirmation) in a facilitated meeting, resulting in "the group" putting the consensus process, i.e., the dialectic process ("the groups" desires and dissatisfactions, i.e., opinion) into praxis (into social action, i.e., group/community/global projects)—what I call diaprax—engendering 'change,' not only in the individuals participating in "the group" experience, but in society as well—as laws are passed initiating and sustaining its use in all facets of society, i.e., in education, in the workplace, in the medical profession, in the military, in the police force, in entertainment, in the media, in community activities and projects, in all branches of government, including government departments, agencies, and organizations, and even in the "church," directly affecting (invading) the home/family, i.e., negating the father's/Father's authority. All the elements of the French Revolution are wrapped up in its praxis, i.e., "Liberté, Equalité, Fraternité," including the negation (excommunication without writ) of those who refuse to participate in or resist the "movement," i.e., who prevent, i.e., inhibit or block the consensus, i.e., "group hug" 'moment' with their traditional "do right, not wrong," absolutist, i.e., "It is written," "negative" ways. After the harlot, i.e., people enjoying the carnal pleasures of the 'moment,' including the affirmation, i.e., the approval of men, comes the beast, i.e., people finding out how much "the group" really cares about them, treating them as an unborn child ("fetal tissue") or an elderly person ("antediluvian"), negating (removing) them when they serve no purpose in their eyes, i.e., when they engender no pleasure or get in its (pleasures) way, i.e., when they have become or pose a potential "burden on society," i.e., when they become "a pain." It is the soviet (washing from the brain the father's/Father's authority) system being put into praxis, i.e., into social action, 'liberating' "human nature," i.e., the carnal nature of the child from the father's/Father's authority, negating the father's/Father's authority in the individual and in society, thereby negating the guilty conscience for doing wrong, disobeying, sinning in the process. The language of the formula (process), i.e., the "I think" and "I feel" turns commands, rules, facts, and truth into an opinion, i.e., belief into a theory, negating the father's/Father's authority, i.e., the "I know, because ____ said so," i.e., faith in the process. The formula 'changes' ("shifts") the paradigm , i.e., the way people feel, think, and act, i.e., how relate with their "self," others, and the world, as well as how they respond to the father's/Father's authority from "doing right and not wrong," i.e., honoring and obeying the father/Father, i.e., doing the father's/Father's will to "approaching (augmenting) pleasure and avoiding (attenuating) pain," i.e., the carnal nature, i.e., the desires and dissatisfactions of the child, i.e., doing their will instead. It is the praxis of Genesis 3:1-6, negating Hebrews 12:5-11, thereby negating Romans 7:14-25. It is the praxis of "self" 'justification' negating the father's/Father's authority in all participants feelings, thoughts, and actions as well as in their relationship with one another, others, and the world, thereby negating the guilty conscience for doing wrong/disobeying/sinning, so that they can do wrong, disobey, sin with impunity. It is what we all do by nature, 'justifying' our "self," until we repent, i.e., until we come to know the Father, through Christ Jesus our Lord and Savior. There is no father's/Father's authority in an opinion or in dialogue, i..e, in "I think" and "I feel," i.e., in the language of psychology. There is no such thing as a Christian psychologist—since Christianity is based upon the Word of God, accepting it as is, by faith, and psychology is based upon the seduction, deception, and manipulation of men, women, and children, propagating the lie that they are "good" or can become "good' by doing "good works," with the psychologist "helping" them "feel" "good" about their "self," resulting in their perceiving the psychotherapist as being "good" him or her "self," following after, supporting, protecting, defending, paying, thanking, praising, and worshiping the psychologist, making him (or her) "feel" "good" about his (or her) "self," affirming the lie. There is no synthesis. Synthesis (you can do wrong, disobey, sin with "group approval" and not be held accountable for your thoughts and actions before God) is the lie. If you are going to get a chicken (rat or dog) to jump through a hoop (follow a maze or salivate at the ringing of a bell) all you need is the chicken (rat or dog), the hoop (maze, food and bell), and the method, i.e., the process, i.e., the formula of seduction, deception, and manipulation. All who fall victim to the formula, i.e., to the process of 'change,' i.e., to the consensus 'moment,' i.e., to psychotherapy become as Thorndike's chickens, Skinner's rats, and Pavlov's dog, i.e., subjects of stimulus-response, i.e., animals, no longer having a soul subject to God, becoming as pimps and pedophiles themselves instead, i.e., no longer feeling guilty for seducing, deceiving, and manipulating men, women, and children, i.e., lying to those who come their way, taking pleasure in using them for their own enjoyment and gain. This is antithetical to the Word and the will of God. All who participate in the formula, i.e., in the dialoguing of opinions to a consensus (affirmation) in a facilitated meeting, hate the father's/Father's authority, whether they call themselves "conservatives," "moderates," "liberals," etc., Republicans, Democrats, Independents, Libertarians, etc., "Christians," agnostics, atheists, etc.,. All who participate in the formula, i.e., in the dialectic process become the same in thought and action (theory and practice), loving the carnal pleasures of the 'moment' which the world stimulates (including the praises, i.e., affirmation of men), hating the father's/Father's authority which restrains, i.e., which "gets in the way." It is not how far down the dialectic pathway (the pathway of dialogue) you have traveled ("I am not as bad as him"). It is that you are on it in the first place. One step on it, as in a pig pen, and you are "in it." The only way off it is to repent, i.e., turn from your deceitful and wicked ways, turning to the Lord, and His Heavenly Father instead.